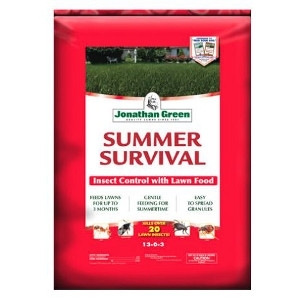 Controls a wide spectrum of insect pests including chinch bugs, army worms, sod webworms, ticks, ants, and over 15 other insects with Bifenthrin. With 40% slow-release nitrogen this product provides a controlled release feeding. Gives the lawn a gentle feeding during summer months to keep lawns greener. No phosphorus formula makes it great for lake and bay communities. Do not apply during hot, dry weather when the turf is under stress. You may seed with this product.